Superman is a killer? No way. Shazam started a war? No Way. Should you be reading this issue, Part 1 of the Trinity War? Yes. Pandora is on a quest to eradicate the world of evil. Only the purest or darkest at heart can open Pandora’s box. She finds Superman, whom she believes is purest at heart, and shoves the box into his hands. Instead of the curse breaking, Superman momentarily gains the third eye and attacks Pandora and Wonder Woman. Meanwhile, Shazam has flown to Kahndaq to spread Black Adam’s ashes across the desert, despite being warned that the government has banned Americans from traveling there. The Justice League, taking Zatanna with them for her expertise in magic, heads to Kahndaq to investigate. 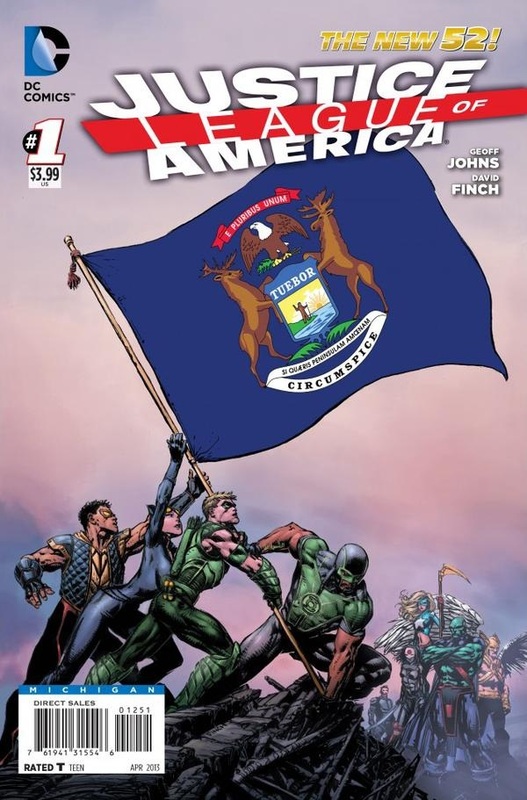 The Justice League of America (JLA) also travels to Kahndaq, but to bring the Justice League back to the United States. We learned in the first issue of JLA that each member has been secretly paired with a member of the Justice League. Their mission is to take down the Justice League if needed. The JLA members are hesitant about their assignments, but Colonel Steve Trevor tells them they’re under direct orders. Of course those orders are from none other than Amanda Waller, that woman I love to hate. The Justice League finds Shazam in Kahndaq, but he is uncooperative. He even knocked down Superman, but he quickly learned that was a mistake. The JLA arrives and informs the Justice League they’re escorting them out. I am stopping my narration at this point because this is where all kinds of hell breaks loose. It is too good for me to spoil, but I will say that some serious fighting is going on. But unknowing to them all is that this war has been orchestrated by the Secret Society of Super Villains, led by the Outsider. In order to appreciate the Trinity War to its’ fullest, I recommend that you read ALL of the issues in this DC Comics major crossover in the correct order (see checklist below). I also recommend that you read Justice League beginning with the first issue if you haven’t already, so that you can become familiar with the characters in the new DC Universe. There are also subtle hints and clues in this title leading up to the war. This title has a mini story about Pandora and a mini series about Shazam. I especially loved the Shazam story. Billy Batson is a young, mouthy orphan boy that is given the powers of Shazam by a wizard. He must defeat Black Adam, an evil antihero. 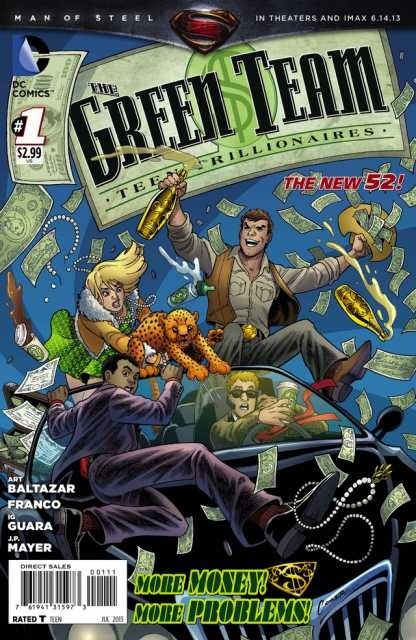 Geoff Johns is the writer of this well written, fast paced, action filled, and constant page turner. Great character interactions and Johns gets straight to the point. I especially liked seeing Madame Xanadu in this story, and how she figured out the meaning of trinity. Too bad she was deceived by Plastique, a member of the Secret Society. 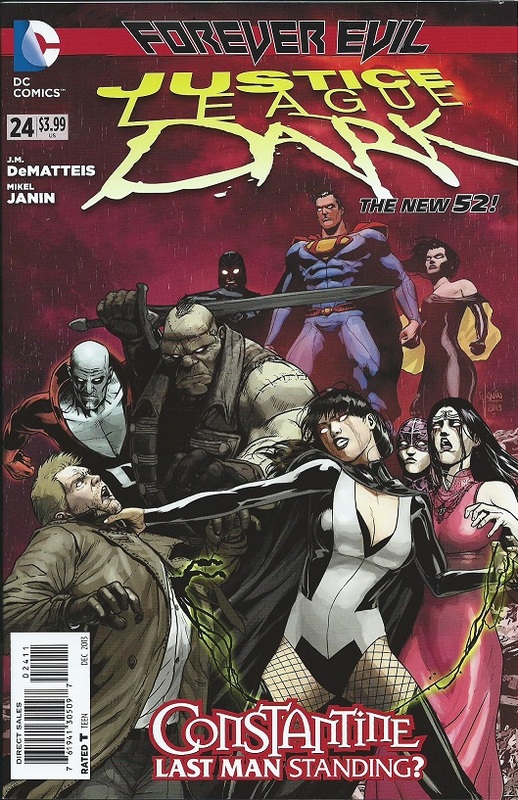 Madame Xanadu was one of the Demon Knights, one of my favorite New 52 titles that was placed on the chopping block. She is also in Justice League Dark, a title that is also in the crossover. The creative art team consists of Ivan Reis, Rod Reis, Oclair Albert and Joe Prado. Visual storytelling at its’ best. Realistic characters, detailed facial expressions and powerful fight scenes. 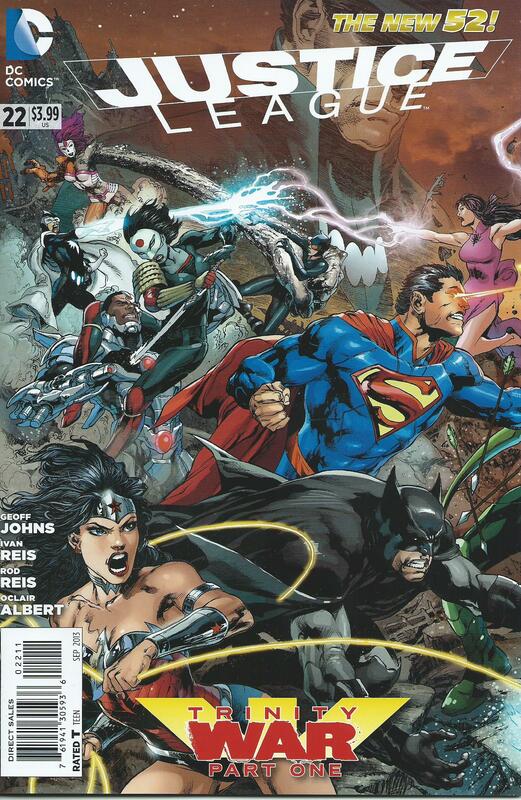 I especially love the cover and the two-page spread of the battle between the Justice League and JLA. The rich and vibrant colors bring it all to life. I have been reading Justice League since the first issue, and plan to continue reading this title. I originally planned to buy all 50 state variant covers for Justice League of America #1. That’s right. A cover for each state. Why did I change my mind? Because I can take the money I would have spent on all those covers that would only sit and collect dust, and buy a variety of comics. So I’m proud to display my MICHIGAN cover! Amanda Waller, Director of A.R.G.U.S. (secret branch of U.S. military) is passive-aggresive, and manipulative from the beginning. She wants Col. Steve Trevor to organize and train the members of the Justice League of America (JLA). Although Amanda says the JLA will help other super-heroes, it’s pretty clear that A.R.G.U.S. plans for the JLA to take down the Justice League. If necessary. The issue focused on Amanda and Steve reviewing the profiles of each team member and the reasons they were chosen. How Steve Trevor plans to organize and train the team is beyond my wildest guess. I can’t wait to see how he plans to train Katana and Hawkman. Katana was an assassin who came to America to track down her husband’s killers. Hawkman (he scares me, and yes I love it) is a police officer from his planet (Thanagar) that captures Thanagarian fugitives. He also passes judgment on the fugitives. Read the comic so you’ll know how he passes judgement. I’m trying my best to not put in spoilers. I’m also trying my best to get you to read this comic, because that’s what this blog is all about! Martian Manhunter is not one to be messed with. He’s powerful, yet mysterious. Spooky is the word I like to use. He pops up out of nowhere. He also knows the true reason Steve agreed to organize the team. But he warned that he will erase the minds of everyone in the building if Amanda Waller or any other government official makes a move against him. Including Steve. Can A.R.G.U.S. be trusted? I don’t think so, especially Amanda Waller. Steve Trevor is going to have his hands full trying to organize such a powerful and diverse group. The team roster is established and each member of the JLA has been paired with a member of the Justice League that he/she is going to take down. IF it comes to that. The debut issue ended with The Secret Society being mentioned. What’s that about? You’ll just have to wait and see like the rest of us. 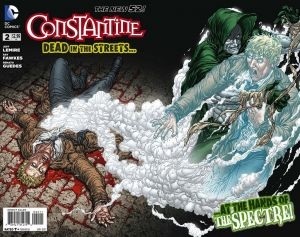 Geoff Johns grabbed my attention with this story from the beginning. Powerful opening. Strong dialogue throughout. Rapid progression. Perfect timing. I know this series is going to be around for a very long time. I love the artwork by David Finch. Scenes flow flawlessly between panels. Sonia Oback did a great job with the colors. I especially like the dark panels. It gives me a sense of fear and suspense. This is one series you definitely want to jump on. I have no doubts about this one at all.